Based on reviews from 1 experts and 1,195 users. 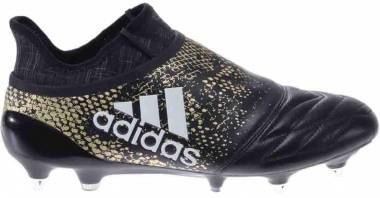 Learn how our rankings work or see our guide to Adidas soft ground football boots. Updated Apr 2019. Not only does Adidas produce some of the best firm ground cleats in the market, but it also creates caliber boots suited for soft grounds. The popular brand is the go-to shop for all sorts of football boots, and its SG shoes speak of quality and performance. Soft ground football boots have been around since the 1950s when the very first screw-in stud, “Super Atom” was developed by Puma’s founder Rudolf Dassler. The significant invention commenced the growth of soft ground cleats worldwide particularly in Europe, where certain seasons caused football fields to turn into muddy, slippery grounds. Adidas soft ground football boot designs range from classic to contemporary. They also boast of various technologies that facilitate better traction on natural grounds that range from slightly wet to muddy ones. Although Adidas may be known for its modern-looking football boots nowadays, it has always set a high benchmark for classic football boots. And yes, even Adidas soft ground football boots have its fair share of excellent heritage cleats. This Adidas soft ground football boot showcases a timeless look and lightweight quality through its kangaroo leather upper. Its overall design is inspired by classic football boots, while its materials are made from durable heritage elements that have been around for the last three decades. The traditional look of the World Cup boots, from the upper to the soleplate, will surely put most of the classic-lovers in awe. Kaiser is the German word for emperor. As its name suggests, this football boot is made to fit kings of the sport through its top-of-the-line comfort and performance. More accurate shots and less water absorption are provided through its full-grain leather upper. Meanwhile, the die-cut EVA insole of the Kaiser 5 Cup SG brings excellent footbed comfort that lessens stud pressure. A remake of a strong football collection released over twenty years ago, the Predator 2018 brings control to a whole new level. As part of the fierce series, the Predator 18.1 SG delivers the same level of excellence in the soft ground arena. Its knitted upper offers lower leg support in a sock-like style while its outsole is composed of hybrid studs suited to bring the right traction on wet grounds. Coming from one of the modern Adidas soft ground football boot series, the X 17+ Purespeed SG is highly recommended for its acceleration-focused features. For one, its Sprintframe outsole is geared for extra agility on soft ground. For its upper, it is fitted with the Techfit compression that hugs the foot in a form-fitting wrap. This Messi-themed Adidas soft ground football boot is the updated version of the original 17.1 SG. One of its technical revisions in the Nemeziz 18.1 SG is the Agility Weave feature found in the forefoot area. It serves to enhance the touch on the ball. The trademark Agility Bandages is still utilized in this model to increase foot support just like how it works in the ritual of sports taping. Adidas has come up with certain lineups that allow players to experience the best of both synthetic and leather world. One of this is the Copa collection which is a mix of heritage and modern elements. A football boot of traditional and innovative features is arguably the best description for the Copa 18.1 SG. This is due to the combination of its kangaroo leather upper and synthetic compression sock. The mixture of both signature materials brings a one-of-a-kind comfort and style to Adidas soft ground football boots. Its overall vamp is also supported by an X-ray cage that enhances ball control. Another soft ground football boot from the Copa collection is the Copa 18.3 SG. It is considered to be the low-tier version of the Copa 18.1 SG. With its modern look, one may think that it is an all-synthetic shoe. However, its vamp is dominantly fitted with kangaroo leather while only its rear area is made with a textile material. Unlike the 18.1 model, this football boot has a fold-over tongue that serves as a separate construction from the vamp. TPU is a standard material for almost all football boots including Adidas soft ground football boots. It delivers the right balance of support and flex, especially on firm natural grass. Furthermore, it has been proven to be long-lasting due to its stress-resistant quality. The 18.3 model of the Predator SG is an example of the Adidas soft ground football boot that has TPU for its base. This soleplate technology is developed under the idea that a significant percentage of ball control relies on the base of the shoe. With this frame, players are provided with improved stability, particularly in the forefoot area. The Predator 18+ SG is one of the Adidas soft ground football boots that is fitted with this innovation. Although soft ground football boots are known for its metal studs, some of them are installed with TPU-based ones. These are usually arranged together with the screw-in studs to even out stud pressure. The Nemeziz 18.1 and 18+ SG are some of the Adidas soft ground football boots that use TPU-based studs. A soft ground football boot will not be as efficient on natural muddy grounds without screw-in aluminum studs. The screw-in studs are replaceable to allow players to adjust the height of the studs depending on the softness of the ground. Without that customizability, players are at risk of injuries when playing. The aluminum studs are also shaped to better dig into the soil. The classic Adidas World Cup and Kaiser 5 Cup are among the Adidas soft ground football boots that have full-aluminum stud configuration. Are soft ground football boots compatible with firm ground surfaces? It is not highly advisable to wear a soft ground cleat on firm ground. Its metal studs would make it hard for the player to maneuver because it may dig deeper to the ground. Its studs produce a certain kind of grip only designed for muddy soft grounds. Players may get injured wearing an SG football boot on any other surfaces including firm ground. In a similar way, it is never recommended for players to use an Firm Ground football boot on a soft ground surface. FG soleplates are not designed to withstand muddy surfaces. Consequently, using it on soft grounds may put players at risk of injuries. Why do I need a soft ground football boot? Soft ground football boots are made to dig better on natural muddy grounds through its specialized soleplate and studs. The screw-in metal studs can be replaced or adjusted based on how muddy the ground is. This is something that other football boots can’t offer, particularly the firm ground boots. To totally avoid possible injuries and lower leg pain, it is highly recommended to use an SG boot if playing on slightly wet to muddy natural pitches. Are Adidas soft ground football boots more expensive than its firm ground variation? Adidas generally offer the same rate for both soft ground and firm ground football boots if both boots are of the same tier. For example, Predator 18+ FG and Predator 18+ SG both have the same rates. However, a soft ground shoe of the same collection but belongs to a different tier such as Predator 18.3 SG is less expensive than the Predator 18+ FG. Does Adidas offer laceless SG football boots? Yes. Some Adidas soft ground football boots are offered in a laceless version. They can be found across almost all Adidas collections including the Predator, X and Nemeziz football boots. Examples of these are X 18+ SG and Nemeziz 18+ SG. The laceless feature is slowly becoming a trend among football boots. Players gain the benefit of a clean striking surface and shot accuracy with this design.